The loss of a pet, a longtime friend and companion, can leave us suddenly lost. Our sorrow can be dark and deep and may feel impossible to overcome as we seek understanding. We want to stay connected to that wonderful soul that has gone ahead of us. Let these flags be that connection. Tibetans believe the prayers of these flags become a permanent part of the universe as the images on the flags fade from exposure to the elements and the wind blows through them. Just as life moves on and is replaced by new life, our own healing can begin, our hearts can mend and find room to love another four legged friend. When we send our feelings on the wind we trust nature to turn our memories from sadness to gratitude for having loved and been loved so unconditionally. 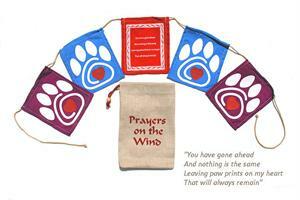 Each flag measures 5 1/4" X 6 1/4" and each string of flags measures 58" in length. Flags come with cotton-jute bag as shown. 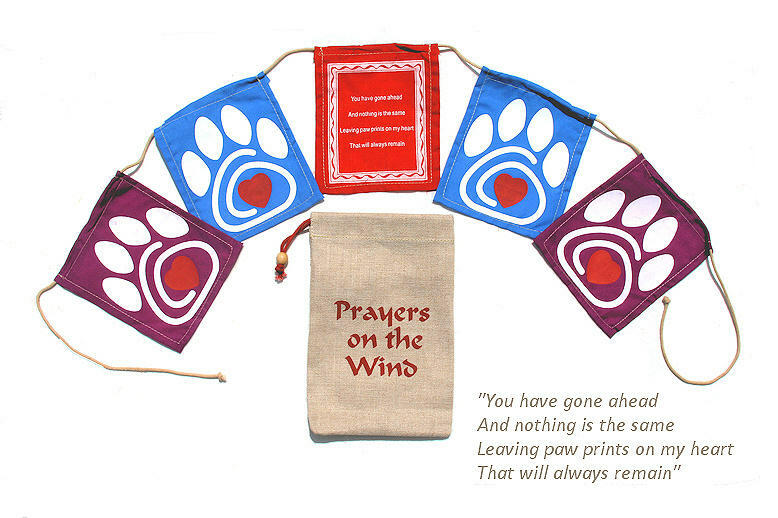 Not only a wonderful tribute to our own furangels, but also a thoughtful gift for someone who has lost their beloved pet as well. There is also a Heart Version of these flags available.